NTS has provided automotive testing and certification services both domestically and internationally for over 20 years. The automotive testing services performed by NTS cover safety, reliability, longevity, durability and functionality. In addition to the wide range of services we offer for product manufacturers of all types, we offer a portfolio of services specifically for the automotive industry. Please browse this section of our site for more information. Vibration testing: Vibration and shock can have profound effects on a vehicle’s long-term performance and reliability. Testing for these conditions requires powerful tools to replicate the cumulative forces experienced over years of driving. NTS Detroit is equipped with both electro-dynamic vibration systems providing up to 16,000 force-pounds vertically and horizontally, as well as servo-hydraulic vibrators featuring up to 20,000 force-pounds with 10-inch stroke. Either of these can be equipped with sophisticated data acquisition tools that record acceleration, strain, load, torque, sound, pressure, voltage and a range of other measurements. Climatic testing: The average vehicle is exposed to a diverse set of environmental conditions over the course of its life. Knowing how a vehicle will react to extreme temperatures, humidity and other conditions is a key design consideration. To facilitate this, NTS maintains over 100 environmental simulation chambers in its Detroit laboratory, including a dual-vehicle drive-in chamber. We can accurately recreate thermal shock, corrosion, sand and salt, atmospheric pressure and many other conditions. Mechanical testing: NTS provides mechanical testing for automotive engines and other components. We also perform fluid dynamics analyses, leak detection and more. 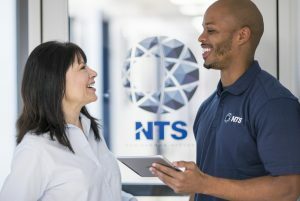 NTS Detroit is equipped with a variety of automotive test systems, including linear and rotary servo-hydraulic actuators for stress testing automotive materials, MTS control systems, a helium mass spectrometer and more. We can design a custom automotive component testing protocol that helps you meet regulatory challenges while engineering safer and more efficient vehicles. Recognizing the importance of this growing market segment, NTS has invested in the tools necessary to test hybrid and electric vehicle components. This includes a 400hp high speed regen dynamometer equipped with a 600V/600A battery simulator that can provide advanced powertrain testing. Our team also designs custom data acquisition and control systems, and we can develop a back-to-back dyno rig for thermal cycling and endurance testing. Whether you work with gas, diesel, EV/HEV or alternative fuel vehicles, NTS Detroit has the technical capabilities to provide advanced automotive engine testing and other services. Our 65,000-square-foot campus is ISO/IEC 17025 accredited by the American Association for Laboratory Accreditation (A2LA) and staffed by a team of expert engineers with a long history in the business. Let us help you meet your auto testing goals. Contact NTS Detroit to request a quote. Automotive testing ensures the long-lasting operation of a vehicle. From the emissions to the engine, regular testing of components can ensure the safety and longevity of the parts and the car they’re in. Our automotive testing and certification services from NTS will verify our customers made their parts to required specs. Automotive testing runs the gamut from paints to pressure. Most manufacturers and contractors require thorough testing with fast turnarounds. Many individual IP tests only need a day, but for additional tests, allow for more time. Stress testing of various systems and components puts the parts through extremes of real-world scenarios. If the parts can withstand the most rigorous testing, they will easily last through the typical uses of even heavy drivers. Environment and use both put heavy tolls on vehicles and their parts. Preventing lawsuits: Lawsuits may occur if your components don’t meet regulations or have some form of failure. Producing test results that show your products were in working order can stop the litigation process or prevent costly recalls. Aligning to environmental standards: The federal government requires specific maximums for specific greenhouse gas emissions from vehicles. To ensure your production line meets government requirements, you’ll need testing. Giving your products an edge: To prove that your vehicles or components outlast or outperform the competition, you need evidence to back it up. Qualified testing creates the data you need to show consumers you have better products than your competitors. 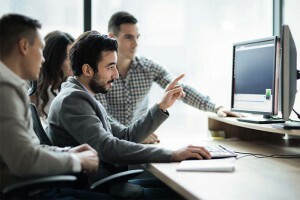 Testing a design: Testing a design before putting into production verifies if you must change anything before final manufacturing produces costly mistakes. Design testing from an outside facility gives the test more credence because the results will be interpreted by an independent third party. Meeting regulations: Your products must meet safety or design requirements before you can sell them. Independent testing to verify your vehicle components meet base requirements will allow you to produce and sell your parts to manufacturers or consumers. The tests you select for your components have their roots in the reasons you need testing. Tests encompass the durability of your parts and the environmental impact of operating them. Automotive testing procedures typically look at part durability or exterior resilience. These two broad categories have several tests within them, designed to verify your parts’ ability to measure up to the required standards. Driving creates constant vibrations on the vehicle’s frame and components. Our vibration testing puts the car through extremes to ensure durability. During vibration testing, ambient movements in the building itself can contaminate the results, but our facility accounts for environmental movement by using high-mass bases and air-bearing pads. These devices ensure our results are accurate. Our testing equipment can exert up to 70,000 force pounds with shakers working in tandem. A single shaker can apply up to 45,000 force pounds. Testing accommodates 60 data channels. We give you immediate results as soon as the test finishes, and you receive a thorough report. Vibration testing helps you improve your component design by identifying weak points when the part gets subjected to random vibrations until failure. Because vibrations occur in all forms of transportation, safety and longevity of parts both rely on being able to withstand constant and erratic movements. To see how much your components can take, you must put them through vibration testing. The environment plays a substantial role in the lifespan of automobiles and their components. Certain climates have conditions that foster premature wear. 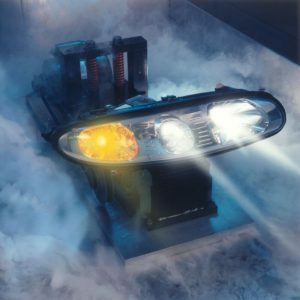 Hot and cold extremes can create stress on automotive parts. We put parts through environmental simulations to see how long the components last. Climatic testing examines UV exposure, heat, cold, dry and wet conditions. Humidity levels matter, especially with metal parts that can rust over time. That’s what makes humidity testing important for car components. In many areas, such as coastal locations or humid places, the excessive moisture in the air could cause rusting of the car’s coatings, wearing of the vehicle’s paint or degrading of electrical parts. Because temperature and humidity tend to rise together, we often test both in tandem. Mechanical operations can wear over time and become less efficient. With automobiles that rely on both electrical and mechanical systems running at their peak for the vehicle to continue working, physical operation testing is critical. Automotive mechanical tests include examining engine performance and efficiency from a variety of systems. We conduct leak detection, fluid dynamics analysis, stress testing and more. Our testing ensures your engines meet or exceed the regulatory requirements without sacrificing the performance consumers need from your brand. Pressure impulse testing puts your system’s hydraulic components through their paces. Multiple systems use fluid movement to create mechanical motion. Regular tests ensure the system maintains pressure and operates as expected for the anticipated lifespan. New designs or models should undergo rigorous testing to prove their performance level matches or exceeds the previous iterations. Pressure impulse testing can help measure the effectiveness of the hydraulic system. At NTS, our pressure impulse testing equipment can test both dynamic and static pressures. Our testing apparatuses, which includes both rotary and linear servo-hydraulic actuators, reaches up to 8,000 psi at 30,000 Hz. For static testing, our setup can reach even higher pressures of 30,000 psi. In addition to examining the impacts of stress during the test, we can also measure torque, strain, flow and force. Reducing pollution is more important than ever. A single passenger car creates an average of 4.6 metric tons of carbon dioxide annually. In addition to carbon dioxide, internal combustion engines also release other harmful substances. To mitigate the effects of these pollutants on the environment, the federal government has set standards for emissions. Engine components and emissions systems must be tested to determine the amount of greenhouse gases they emit. Without appropriate testing, polluting engines could net their manufacturers hefty fines from both the federal and local governments. The EPA has ever strengthening requirements for greenhouse gas emissions from on-road vehicles. A typical emissions bench can measure the amounts of carbon monoxide, methane, hydrocarbons, nitrogen oxides and carbon dioxide. Adhering to the EPA’s requirements is critical to avoid fines. Luckily, 19 out of 21 vehicle manufacturers did not carry an emissions deficit from 2016 to 2017. Companies that held debt had only three years to break even on greenhouse gas emissions by lowering the amounts from their vehicles to comply with federal standards. Between 2012 and 2025, the EPA will increase the standards, becoming stricter over time to reduce greenhouse emissions. Bench testing of gaseous outputs from an engine can verify compliance to guide the manufacturer to make changes to the engine’s design. As a catalytic converter ages, it becomes less efficient. The catalytic converter is an essential component of the emission control system. Some states have strict requirements for the catalytic converters that can be installed on cars sold in those places. Catalytic converter function is vital for the engine’s ability to adhere to emissions requirements, and premature failure of a catalytic converter could indicate a product that needs a redesign. To test how quickly a catalytic converter’s effectiveness reduces, you’ll need aging cat automotive testing services. These services can test a catalytic converter’s limits without waiting for the average 100,000 miles required to reach its typical lifespan. Additionally, catalytic converters age faster when oil leaks from the engine. The aging test program can see what happens to a catalytic converter over time with or without oil contaminating the system. Creating reliable catalytic converters is essential for vehicle emissions systems and car owners. Typically, the lifespan of the catalytic converter is the same as how long a typical driver uses the vehicle. These similar time spans are advantageous because replacing catalytic converters is extremely expensive due to the precious metals used in the catalytic converter’s construction. If a driver fails to replace the catalytic converter, they will contribute far more pollutants to the air the catalytic converter would normally have neutralized. Ensuring the long life of a catalytic converter can prevent this scenario from occurring. SHED stands for sealed housing evaporative determination. This testing method allows for the measurement of evaporative emissions from an engine. Due to stricter emissions laws, this type of automotive testing is likely to become even more popular in the coming years. The SHED is a measuring device that measures the emissions from a fuel system or a system component. Unlike other tests that examine individual components, the SHED testing can measure the amount of evaporative emissions from the fuel system. Testing of smaller parts requires mini or micro SHEDs. Measuring the amounts of evaporative emissions means testing the efficiency of the fuel system’s ability to collect and release fuel vapors. Canister loading tests the filling and purging of evaporative emissions canisters. Testing the canister load and purge ensures the evaporative emissions system accurately cuts down on pollutants escaping from the fuel system. The ability of a canister to absorb and release fuel vapors is a crucial component of the evaporative emissions system. Without a canister that loads and purges appropriately, the vehicle will be more polluting and run much less efficiently. The exterior of a vehicle protects the interior, and if it cannot stand up to standard stress, it will undoubtedly fail during unusual circumstances. Paint and coatings on cars protect the vehicle from rust and wear. But some environmental components such as gravel, sea spray and road salt can prematurely corrode the paint or coating. Testing verifies the durability of a surface layer in these extreme cases. Testing paint and exterior coatings ensures those coverings prove as durable as expected. Our paint and coating tests include examining abrasion and weather resistance. Testers put the paint through a variety of test programs to determine the reliability of the product. Only when the coatings pass the tests can they be used for vehicles. Testers subject the paint to multiple stresses. Abrasion testing scuffs the paint to see the level of scratching the paint can withstand. The ability of paint to avoid showing damage from minor scratches is highly desirable for consumers. Additionally, this resistance to damage increases the lifespan of the vehicle’s coating. Though aftermarket paint jobs are available, most consumers want the paint on their car to last for the life of the vehicle. Salt fog replicates the paint’s exposure to road salt or sea salt spray. While not every climate will need this test, it’s critical for places with cold winters or coastal exposure. Even in locations that don’t necessarily need salt fog tests, weather testing for paint durability in rain and sun is required. At NTS, we put paint through 1,000 to 2,000 hours of rain and ultraviolet light exposure. Temperatures also range from high to low extremes to determine the paint’s strength. Chemical resistance tests the paint’s ability to remain looking good when exposed to automotive fluids such as antifreeze, coolant, windshield wiper fluid, oil and gasoline. Because it’s inevitable that the paint will be subjected to these substances, quality performance in the chemical resistance tests is essential to the paint’s passing the barrage of studies. Gravelometer testing is another means of measuring a coating’s resistance to abrasions. In a gravelometer test, the samples have 300 pieces of gravel heaved at them by the machine’s air pressure. How much of the coating gets chipped off determines the results of the test. We do our testing to ASTM and SAE standards, so the final scores from this test and all our automotive testing programs can be trusted to be accurate. Autonomous vehicle manufacturing testing ensures that self-driving cars are safe for people both inside and outside of the vehicle. With self-driving cars come many new safety hazards that aren’t a factor with manually driven cars. Concerns surrounding self-driving vehicles include safety of the vehicle, the safety of others, and how autonomous vehicles will respond in emergency situations. The testing of these vehicles includes testing both mechanical and electrical components of the cars. At NTS, we have experts who can help you test autonomous vehicles for safety and performance. You need accurate results when you have your components tested. We use industry standards to create our testing procedures, so you can be assured of reliable reports. We have the equipment and professionals who will perform the automotive testing services you require for performance or regulatory compliance. Contact us at NTS for a quote for any automotive testing you need. Our professionals are here to lend their expertise to your situation.